Stop playing safe! Be daring and embrace attention-grabbing designs. If your designs are not grabbing any attention, what’s the use of selling them on the market? A simple design will blend with others, whereas an attention-grabbing design will catch people off guard. For all your eye-catching designs, you have us by your side. Our domestic fabric decorating service is known to make head turning designs happen! We have had several clothing designers in the past come to us with the most bold designs and when completed, they looked fabulous…no, extra fabulous. Why go for designs that capture attention, you ask? Let’s give you the reasons. When customers visit a retail store, they will see lots of clothes. They will browse each clothing shelf, sifting through designs, until one grabs their attention. The one that grabs their attention needs to be from your design collection. That is why you need to embrace attention-grabbing designs, and not turn the other way. If you opt for a simple design, it will get lost among all the clothes with simple designs. Our domestic fabric decorating service will ensure to create a design that will make other clothes look dull as compared to yours. Use your imagination to create a design that leaves a lasting impression on your customers. When you create bold and daring designs, designs that hardly anyone has ever come across and you make them happy by adding rhinestones, pearls, and other types of embellishments on it, people will notice. When they notice, they will buy. When they buy, you earn money. 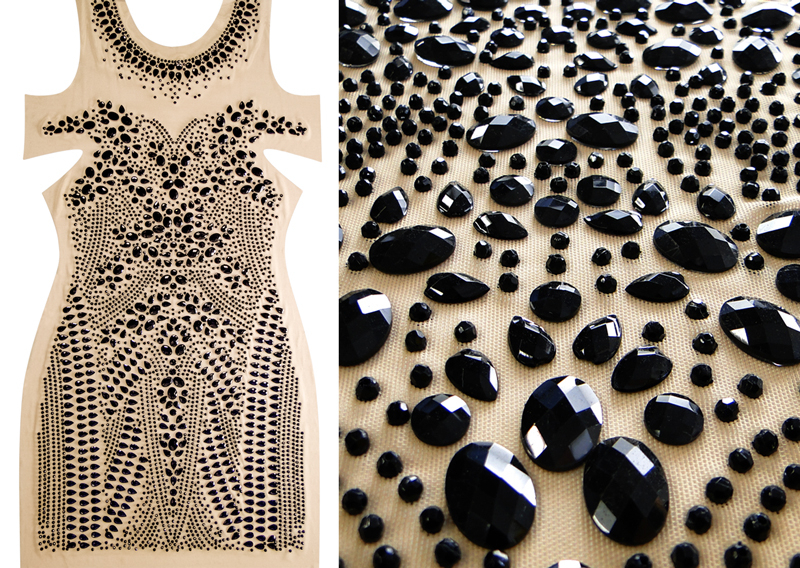 Why don’t you send your bold and daring designs to USA Beading? We will make them stand out even more by adding beads to them. Every clothing designer has one wish — to retain their loyal customers. If you are selling clothes that make them stand apart from their friends, family, and colleagues, they will favor your clothes over clothes from other designers. It is important that you make sure you have loyal customers if you want to keep releasing your clothing lines, which is why, sometimes, you need to get out of your comfort zone and make your clothes sparkle. You want your name to be up in lights, but that will not happen overnight. It takes time and effort, which is why we emphasize on creating funky patterns on your clothes. The more your clothes will attract people’s attention, the higher your chance of becoming a known clothing designer in your area. You want to be known for creating clothes with an edge. Everyone can create simple clothes, but creating clothes that are attention-grabbing, yet stylish, is not easy. USA Beading knows that you can do it. Come up with designs that will make people stop dead in their tracks and pause to admire it. Use our domestic beading service to make your attention-grabbing designs a reality.